This is nothing to do with anybody called Winston Stiles, although it’s quite a good name for a character in a novel, I would have thought. No. This is more to do with making a right of way which leaves Cleatlam in Teesdale and goes across a shallow but ancient ditch marking the parish boundary into the parish of Winston. One stile had barbed wire along the top and was falling to bits and the other had already fallen to bits. Eight of us – four paid County Council staff and four DVCRS volunteers, met a small dog in Cleatlam and poddled off through a muddy field to get to the offending structures. The little dog – just a pup, really, gave a yelp at the first stile and ran off back home, being chased by a local horse. A bit odd…. till we discovered that one of the strands on the fence – a bit rusty and quite old, was electrified and was putting a jolt out every two or three seconds or so. Many of us felt the benefit of this bonus to our levels of alertness. Stiles 1 and 2 – Before…. The short version of this tale has us digging holes, putting in new posts and footboards and finishing off the job with some waymarker thingies. Stile 2 had a bit of new fencing and some wire to make it lamb-proof. The stile 1 working party had a small crowd of horses which came to investigate every now and then. It was a nice day. I hope the locals in Cleatlam will enjoy being able to follow this path without ripping their naughty parts on the fences or falling off the dereliction. Addlebrough On A Fairly Windy Day. A small but select contingent of Clan Knipe (me, the nephew and the nephew’s wife) gathered in Bainbridge where it was chucking it down, despite soothing noises from the Met Office about blue skies and it being a “breezy old day” There was no mention of the multiple rainbows. We set off, damply. The River Bain was on the point of going a bit mad. The little hydro-electric screw thingy was turning at a fair rate and, presumably, producing electricity. The sun came out and the clouds went wherever clouds go when they die – heaven, probably. Where else would the angels sit? We walked along a limestone shelf in a strip of ash and blackthorn and then on the road to Thornton Rust where there was more traffic than there should have been. Then we sploshed the draughty bridleway that sneaks around the back of Addlebrough in a nithering headwind. Addlebrough, I should explain, for those not in the know and who just can’t be bothered with Google just now, is a flat-topped, neat little hill of carboniferous limestone and a bit of gritstone overlooking Wensleydale. It is blessed with some ancient cairns and some cup and ring marked rocks (none of which we saw) and some “settlements” which could be iron age. The outlines of these are fairly obvious from above and remains of walls and enclosures can be picked out. There’s also several legends concerning giants, buried gold, fairies and advice on not swearing or using any bad language should a fairy indicate the location of a chest of gold. So, it’s a rich landscape. 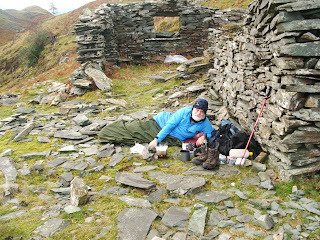 We lunched in the only bit of shelter behind a wall. Bruno noticed my egg butty. I have a picture of him trying to hypnotise it…. A couple of lads appeared and explained how they’d been blown off Addlebrough by severe and dangerous hurricanes of such ferocity that in trying to light his pipe, the sparks from the over-oxygenated tobacco blew back and ignited the lad’s woolly hat - And that the ladder stile at the top was a windy nightmare with a wind chill that would make a polar bear shiver and that the g-forces involved in fighting against this maelstrom had ripped the very eyebrows off a fellow rambler and that they were off to the Black Bull to calm down and warm up a bit….. This smacked of exaggeration to me. A permissive path leads across the moor and then steeply up to Addlebrough’s flat top. It was windy. I took a picture, but the vibrations of the breeze on the arms holding the camera have blurred the image. By this time,we were starting to lose the light a bit, so we abandoned tentative plans for a hike around the local green lanes and a ramble by Semer Water for a quick and easy plod down the road back to Bainbridge. 8 miles is what we did. Nice to see the rellies again….. I met the bro and his pal Ian at Dufton and we had a short tour of some back lanes and then hurtled off through the murk up round the back of Dufton Pike and further up to the mines at the head of Great Rundale Beck. A brief jink to the Right, which may well have been South and a clamber through some bouldery scree saw us at the trig point on Backstone Edge. The actual top is a little way over there-------> through some mist where there’s a cairn with a stick in it and is a few metres higher than the trig point at 699 of your Queen’s metres.. The forecast was for the murk to clear to sunshine, but there wasn’t much sign of this as we blundered through the tussocks to Great Rundale Tarn and lunched in the shooting box nearby. Great Rundale Tarn is unsuitable for swimming at this time of year, I have to report. Just a tip for you there…. A long slog through squishy bogs and teetering tussocks with a few of those brown contoury things (look, I’m sorry for being so technical about this…) brought us eventually through yet more clinging hillfog to the big cairn on the top of Knock Fell at 794 metres. Normally, navigation through this thick clag could be quite tricky, but John had his fancy GPS thingy with the maps on it and a thick blue line to follow, so despite a few diversions around peat hags and the very very squishy bogs, the electronics ensured success. I had a map and a compass in my rucksack, obviously. In an emergency, we could have eaten the map. But anyway, the Pennine Way runs past this big cairn and also the much older, square one on the edge – Knock Old Man – so we followed this back to Dufton. At some point, high above the Eden Valley, the sun came out and the clouds drifted away. Our only difficulty was the deep cow muck around Far Close, occupied by some cattle, more intent on feeding than chasing Bruno, who was happily paddling in the sludge anyway. And that was that. Eleven miles and 2600 feet worth of brown contoury things and not much of a view. I must say, though, that towards the end, when the sun came out, things did start to look and feel a bit more wintery and the temperature had dropped from 10 to 4 C, so , y’know…. it might just have decided to turn at last. We did the walk by the Wear on Saturday and ten people turned up, including the two stewards Bruce and Eric. I think it went OK; we didn’t get chased by the horses and nobody fell in the river, and we got back in daylight (just). I took a picture of an oak tree, still with it’s leaves, although they’ve turned colour. Most of the deciduous trees are now stripped and ready for the winter that appears to be refusing to arrive. But, I’ve had a little insight into what goes on beside these Pennine riversides in terms of trees and undergrowth. On Friday, I went to the launch of the Heart of Teesdale Landscape Partnership and one little gem of information tickled interest. The River Tees has, in the past, been subjected to what is known locally as “Rolls”. these are sudden flash floods that happen, or at least used to happen, usually, around twice every year. These flash floods, in the past, have been dramatic and, occasionally, tragic, removing paddling children and browsing cattle. In some places, the spirit of the Tees, one Peg Powler – a River Goddess or, lately a demon or witch, was blamed for this and children were warned not to play by the river lest Peg should rise and take them away. Y’see, you learn something every day, innit? I’ve just seen my name on the TGO Challenge website list of challengers for the 2012 TGO. If I manage to complete it, this will be my eleventh TGO Challenge. I can now start the planning proper. I have a starting point (which I’m going to keep to myself for a while) and a finish point – which will probably be Aberdeen docks – and I have some bits in the middle and some gaps to fill in. This will exercise my slowly degenerating mental abilities over the next few weeks. The there’s the Annual gathering at the Snake Pass. The Over the Hill club have arranged a meeting which coincides with the date – 9 to 11 March next year. I think this happened on previous years. And I have a Durham County Council walk at Baldersdale on the Friday – so there’s a bit of congestion. I’ll be off to the Snake, though, probably on the Friday night. So, its all very exciting again. I know that several bloggers who are being followed by this blog are also on the Challenge next year, so its likely that if I keep banging on about it, Pieblog readers will have had their fill of the damn thing by next May, so after this, unless something significant happens, I won’t be mentioning it again till next March at least. I expect that this will come as a bit of a relief to non-TGO Challenge fans. First of all, lets just discuss this interesting graffiti wot I found on a waymarker post. Alan Loves Enid 4 Eva. Does this mean that Eva loves Enid but has delegated the job to Alan? Or has Alan just made some assumptions…. Who knows? Anyway, me and superdawg had a five mile walk from Newton cap Viaduct at Bishop Auckland, alongside the River Wear for a bit and then back on the Bishop-Brandon walk which is along the old railway line from Bishop to Durham. We met horses. These two should appear in a caption competition. There’s a bit where the path climbs up around a crag where the water is deep and still and occupied by ducks and something lurking in the water. Its about that time when the salmon run upstream – so maybe it was salmon. But otters have been recorded here too, so maybe…. The actual guided walk is a Saturday Afternoon Special, starting at Newton Cap pickernick place at half one. Its a bit muddy and there are some enthusiastically friendly horses to scare the timid. It may go a bit dark at the end. My headlight is broken. I put new batteries in and the on/off switch won’t switch it off, so I have to turn a battery around the wrong way to turn it off. This is not a hint to family members considering Christmas presents… but…er…….. Here's a couple more pictures around the Castle Crag Remembrance Day service. These are from Brian. Its also been pointed out several times that a few days ago, calendars and clocks hit the magical 11.11.11.11.11 thingy. This won't happen again in my lifetime, unless I meet that timelord at chucking out time outside the Coach and Horses again. In order to commemorate this event (or should it be commmmmmmmemorate?) - Here's a little relevant video fom youtube. I arrived at Brian’s at about four. We arrived at our bivi site at roughly midnight, What happened in between was partly planned (Brian made spagbol – v.nice), partly spontaneous (pint at a pub in Keswick) partly pratting about (I think somebody may have been slightly drunk) and partly incompetence – which I will now explain. We parked badly near the old chapel at Grange. It was here that I discovered that my headlight wasn’t working. This is a basic error on my part but the moon was bright… and…er…. we set off into the night. And ..er.. we didn't actually have one of those map things. Or a compass. Or a GPS. We did have two bottles of red wine but Brian had forgotten his sausages. None of this was a problem. Obviously. 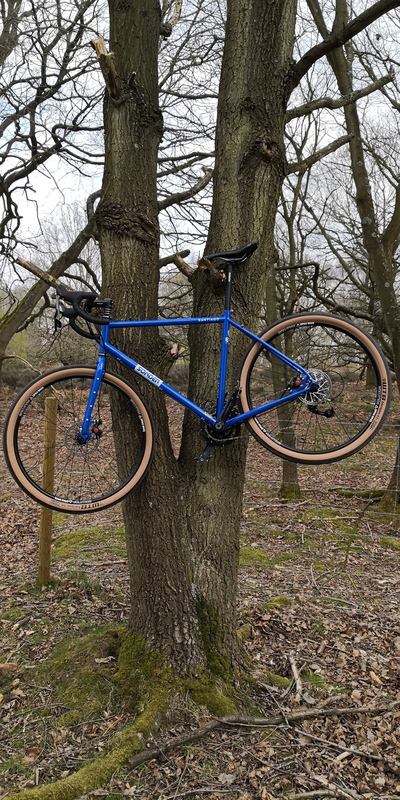 At some point (just after blundering into a bog), we missed a crucial signpost and went merrily along the Cumbria Way and up a vague path to a dead end in a steep quarry. We agreed that this was unlikely to be the way, so we retraced. Hours passed. The moonlight burned down. I didn’t really need a light most of the time, although slippery rocks in the black shadows were occasionally treacherous. An owl giggled. Having walked a substantial way back to Grange, we started again, apparently up the right path. It was steep and stony. My new boots worked well. As we passed the spoil heaps, I tried to stop Brian barging up the hill but hewasn’t listening. We arrived at the top of the hill. I suggested we went back down again. We went back down. Brian said we were going too far down, this time, Pieman. I didn’t think so. I suggested that he looked where he thought the place was and that I would call him when I found it. We split up. Very soon afterwards,(about midnight) I found the hole. We communicated through flashlight, shouts and me pressing buttons on my mobile phone. I didn’t like the cave, so I camped outside. Brian settled into the hole in the hillside with a deceased sheep for company.I just had a few spindly spiders to talk to. The next two hours were nothing short of brilliant. I watched the moon and the stars and the little fluffy clouds forming and dancing as they hurried passed. I sipped wine from a polythene mug. I was toasty in my bag. The owl ghosted by once or twice. There was a warm wind. There were dark moonshadows and a bright and starry sky and almost silence. It was just magical. In the morning, the sky had clouded over. I lit the stove and used this to light the hexamine – and brewed and boiled NATO hamburgers and beans in their bags. We scoffed. We lit a little birch fire for a while. Then we heaved ourselves up Castle Crag for the service of remembrance. A hundred and fifty or so people also came. The sun shone and it was warm. Afterwards, I explored a second slate mine a bit further up the hill and found a deep level going into the hillside till I couldn’t see enough to go further. It had a shelf which could be made comfortable with some effort, and a fine balcony for a camp/bivi site just outside. We plodded back to Grange where, after a cuppa, we returned to the grey and foggy Pennines. The boots were really handy for preventing accidental wine spillage by the way. 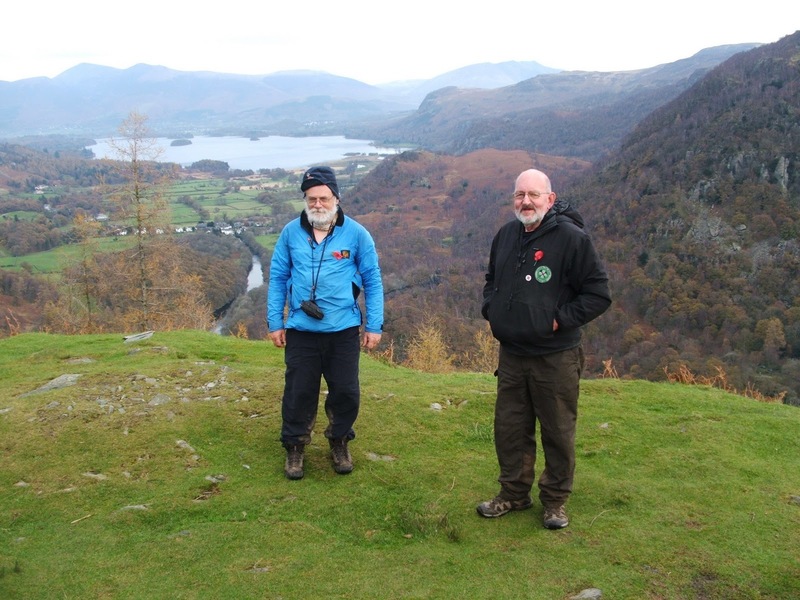 And the Castle Crag remembrance service? – It’s a small and informal affair, but seems to have more depth somehow than the service on Gable. The last time I went to Gable, I got the impression that some people were just there for the tick – to say they’d been, in the same way they climb Tryfan and Helvellyn and Snowdon and have a little book with a list of things to do in it. 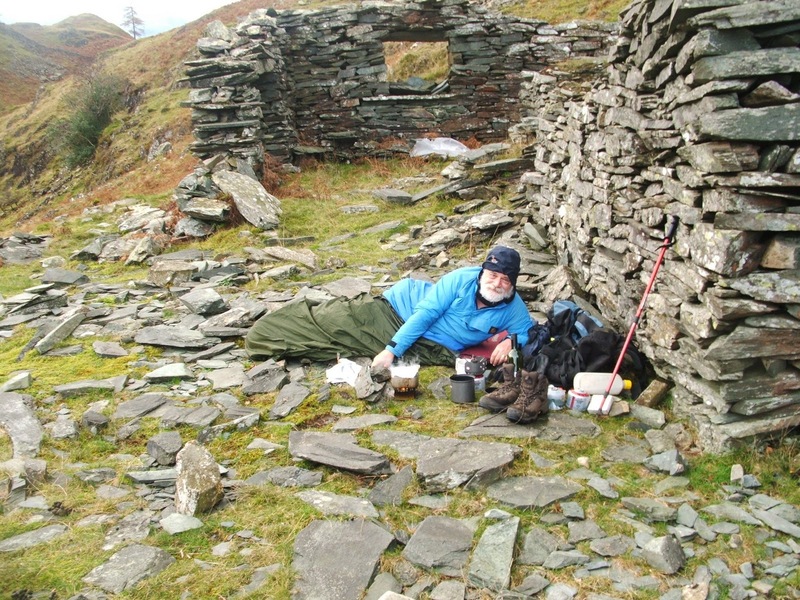 “Number 10 – Go on a wild camp, Number 11 Join the MBA and get a list of bothies, Number 12 Gt Gable service thingy in ? November…” Indeed, several failed to shut their big gobs during the two minutes silence. This doesn’t happen at Castle Crag and a there’s a prayer or two, a proper silence and a little lass and an Arnhem veteran (aged 90!) read short poems. I may be wrong about Gable – I’m sure most people go there for honourable reasons. The other thing is, its much easier to get to than Gable! I have two completely different, separate and otherwise unrelated events to report for this weekend. This is the first. There’ll be another along after I’ve eaten some salmon and stuff….. Some people may recal that I did a reccy around Hudeshope the other day. This is the walk that I did the reccy for. Together with me, El Leaderoni, as I like to call myself, we had El Stewardoni’s Clare and Neville; a Top Team and As wall as this we had a bunch of walkers, and the whole group totalling 21 souls in all –22 if you include the collie. This is probably a record. More mud was met on the return through the Elphatory Allotment and still nobody knew what an Elphate was, except to say that it isn’t a large, grey animal with big ears and a trunk. Some small fish obliged El Leaderoni by jumping through a watery pipe just at the right time. They may not have been salmon, but to us, they were piscitarian joy – probably small brownies, I suspect. More slithering in a muddy kind of way was done through the Northern haymeadows bit and one rambler who’s name is Ivy, indicated a better finish to the walk thatn the one I’d planned, so we all followed her. Next time we do this walk, we’ll go this way – around the back or Ivy’s Alternative as it shall henceforth be known. It was a bit nearer seven miles than last time. 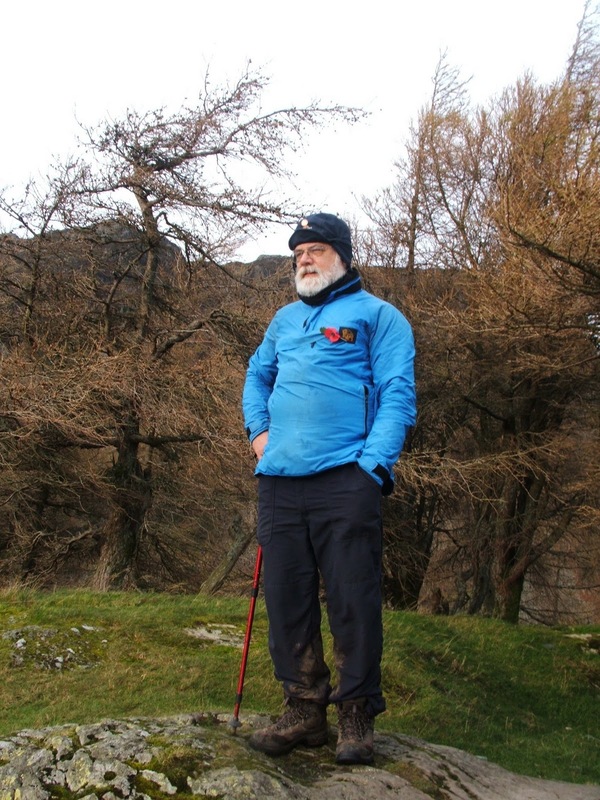 Afterwards, I went to Nenthead to meet Brian so we could go to the Lake District for a little adventure. We arrived at half nine, after a pint of something foaming on the journey. 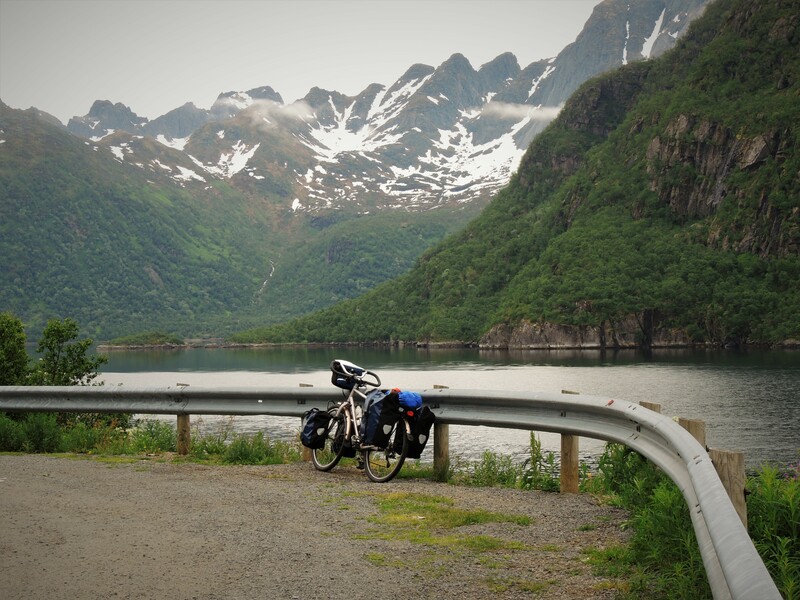 The next post is all about what happened next. There is a little knoll in Teesdale which has a round and wooded enclosure. This is Kirkcarrion. Alf Wainwright suggested that it might be haunted. The local legend has it that it is the burial place of Caryn, a bronze-age or, more likely, iron age Prince. This place may well appear in a pieblogpost in the next half a dozen weeks or so……. There will now be a short interval. Put the kettle on, let the dog out, let the cat in, ring your Aunty about the birthday present and nip to the loo…… Try to get these in the right order.